with no in-depth notes? See below. To give yourself the competitive edge over those who don’t use this service. 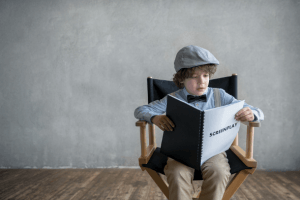 Producers, agents, and screenplay contest executives all say that many of the screenplays they see are flawed in ways which are obvious to industry pros, but which seem to be invisible to their writers. My notes will identify those flaws and help you address them. Industry insiders also say that proofreading mistakes (grammatical errors, typos, spelling mistakes, and basic formatting errors) are among the worst mistakes you can make in a screenplay — and the most common. I’ll catch and fix those errors and give you notes about them. Need convincing? 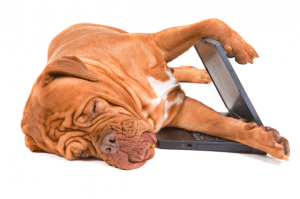 Click this link to read a sampling of industry comments on typos, spelling and grammar mistakes, and basic formatting errors I received in survey responses. their time if it is full of spelling, grammar, and basic formatting errors. Yes, that is harsh. I am sorry to have to say it. But it’s the way the industry is. I’m not trying to offend you. Just the opposite: With 100,000+ spec screenplays hitting Hollywood and the British film and TV industry every year, I’m here to help you beat the odds. 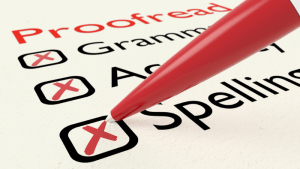 I can fix your grammar, spelling, clarity, and basic formatting mistakes for you. 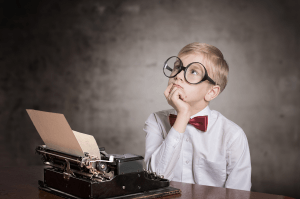 ● Rewrite your synopsis: $30 per 300-word page. ● Write a query letter and query email from scratch: $49 with screenplay proofread, otherwise $65. ● Evaluate your logline: FREE with screenplay proofread, otherwise $25. ● Write three suggested loglines for you from scratch: $19 with screenplay proofread, otherwise $49. ● 50% surcharge for a 48-hour turnaround (no surcharge for proofreading only without notes). ● Next-day delivery (“Drop everything and read my screenplay ahead of your rush work!”) – 100% surcharge. But do plan ahead and save money: order at least several days in advance. A brief overall view of the quality of your story. A gentle list of any story problems and issues I see. How well your script performs on eight vital story and script elements. 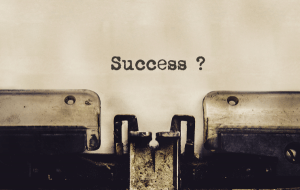 How well your story matches the classic screenplay structure of a famous screenwriting guru. How well your screenplay “romances the reader,” using a 14-point checklist, distilled from more than 5,000 feedback comments by screenwriting contest judges I hired back when I ran screenplay contests. Your idea of what a producer looks like? Why not, if your work looks professional? In the Proofreading Notes, I comment on proofreading issues which arise more than once in your screenplay. These notes may include, but are not limited to, issues of grammar, spelling, sentence structure or lack thereof, formatting, and basic screenwriting how-to. For example, if your scene descriptions include significant instances of failing to tell the story visually (often called violations of the “show, don’t say” or “show, don’t tell” rule), these will be mentioned and discussed. 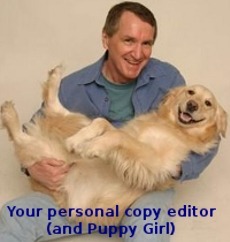 ● Copy editor at daily newspaper, The Record, Hackensack, N.J.
● Writer or editor of news stories that won five national journalism awards.